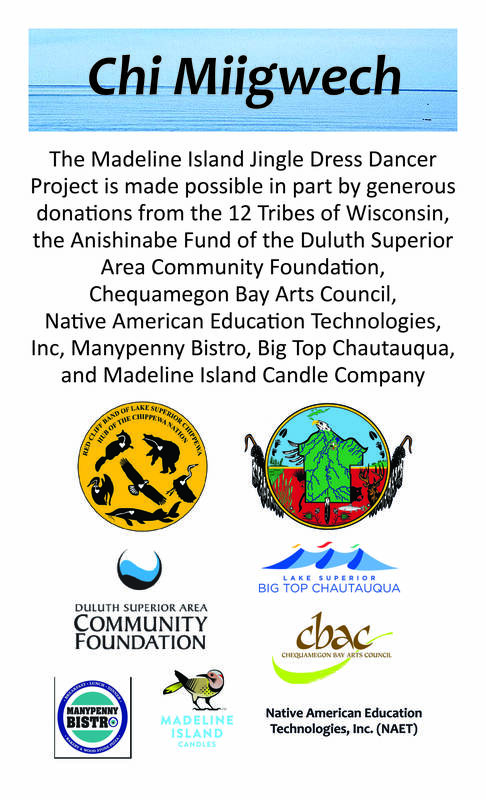 Our Madeline Island Jingle Dress Dancer Project Stand is now touring as a mobile workshop and information station! So far, we have been with Red Cliff through a Sober 49 and the Language Immersion Camp at Raspberry Bay, and both the Lac du Flambeau and Lac Courte Oreilles pow wows. 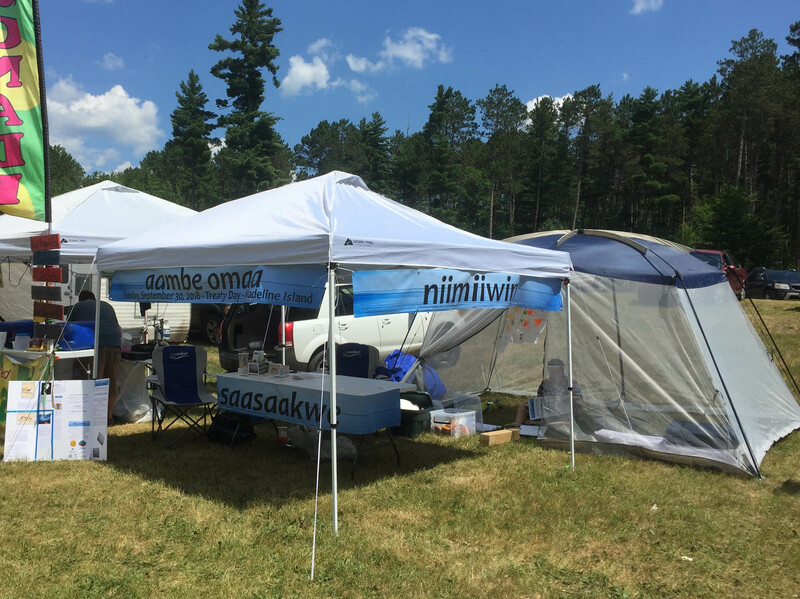 Over the next three weeks, we will be with Bad River Youth at their Indigenous Arts and Sciences Camp on the Island, at Wikdal Park in Washburn for Brownstone Days, and to Big Top Chautauqua. SEE FULL SCHEDULE HERE. By the time we come together for our two weeks of workshop/camp on the island beginning August 13 at the Harry Nelson Rec Center, we will have most of our dancer’s finishing touches completed and ready to come together in her final construction. To send your child to camp, contact Katherine at the phone number below. 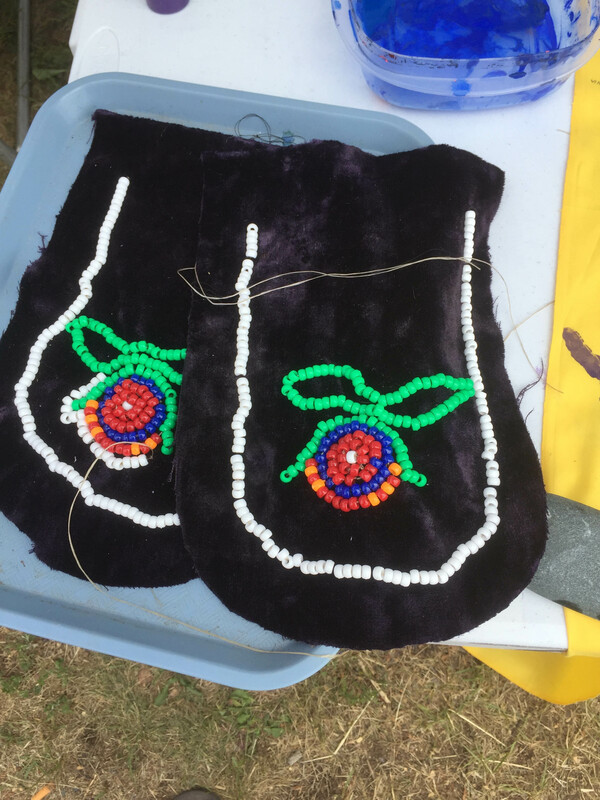 Workshop efforts have already yielded yards and yards of fabric covered with hundreds of children’s hand-prints for our elder dancer’s dress, and nearly completed beaded moccasin tops on velvet; the beginnings of an 80-inch belt and leggings parts are coming together. Community members have also completed drumsticks to be added to a giveaway when our dancer debuts on Treaty Day, September 30, on Madeline Island. To come to Treaty Day, contact Katherine for more information on transportation to the island. 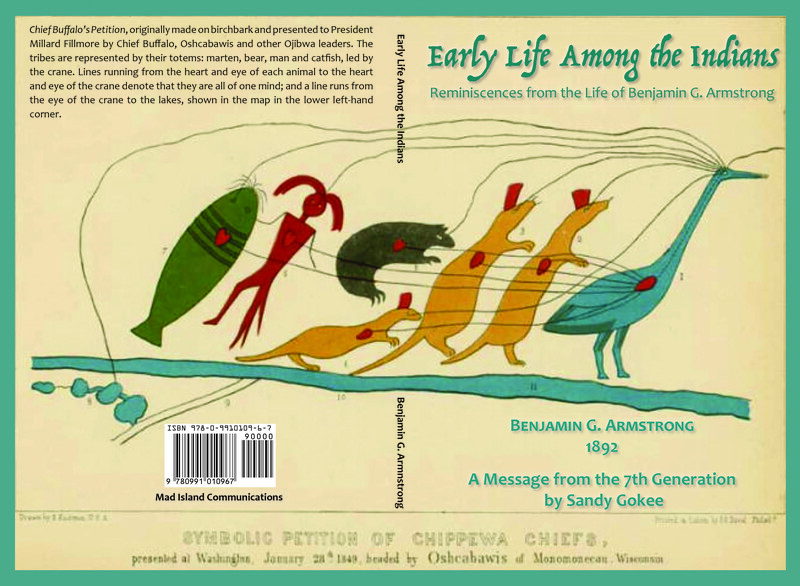 We now have published Early Life Among the Indians, Benjamin Armstrong’s memoirs of his trip to Washington DC with Chief Buffalo. Sandy Gokee, 7th generation descendent of Chief Buffalo, has written a forward. Proceeds from the sale will go to our Jingle Dress Dancer. The book is available for sale online here, at our information station, and via the moccasin telegraph. The publication serves as a component of our goal to challenge teachers of Wisconsin to teach a lesson from our local history. Already teachers are rising to the challenge and this project will make copies available to teachers for their class as we move forward. To order bulk copies of the book, contact Barbara at the phone number below. We have also issued an open invitation to Native artists to participate in an arts exhibition throughout the month of September on the island. We have secured venue space and reception details, and have begun collecting contact info, portfolios, and digitizing original art to work forward with artists for exhibition. If you are a Native artist and wish to participate, contact Katherine at the number below. Please consider stopping by one of our tour stops and lend a hand to this historic project. Katherine at 920.489.9993 or Barbara at 715.209.5471.